Note that Caesars Brookdale on the Lake closed in 2008. This article provides background on the property as well as possible future development and suggestions for alternative places to stay. Brookdale was one of four Starwood-owned Caesars properties in the Pocono Mountains area of northeast Pennsylvania. The Caesars name is perhaps best known for couples' mountain retreats but this property was geared toward families. Brookdale was built on 250 wooded acres on a private lake near Scotrun, Pennsylvania, a 90-minute drive from both Philadelphia and New York City. The resort was known for being very family-friendly, offering spacious suites that could accommodate as many as eight people; indoor and outdoor pools; biking, paddle-boating, and more. Pricing was nearly all-inclusive, with all-you-can-eat breakfast and dinner, special kids' menus, a sundae bar, late-night snacks, family activities, nightly entertainment, poolside movie nights, playground, fishing, biking, paddle-boating, tennis, miniature golf, archery, and (in season) snowmobiling and snow tubing. Kids age 5 and older were able to attend Brookdale Kids Kamp at the resort, where activities included face painting and magic shows. The area also includes ski resorts, petting zoos, Big Pocono State Park, and other attractions. In September 2014, The Pocono Record reported that the shuttered Caesars Brookdale Resort had been sold to Silverleaf Resorts, a Texas company that planned to turn the 232-acre site into a timeshare property named Brook Village at Caesars Brookdale. 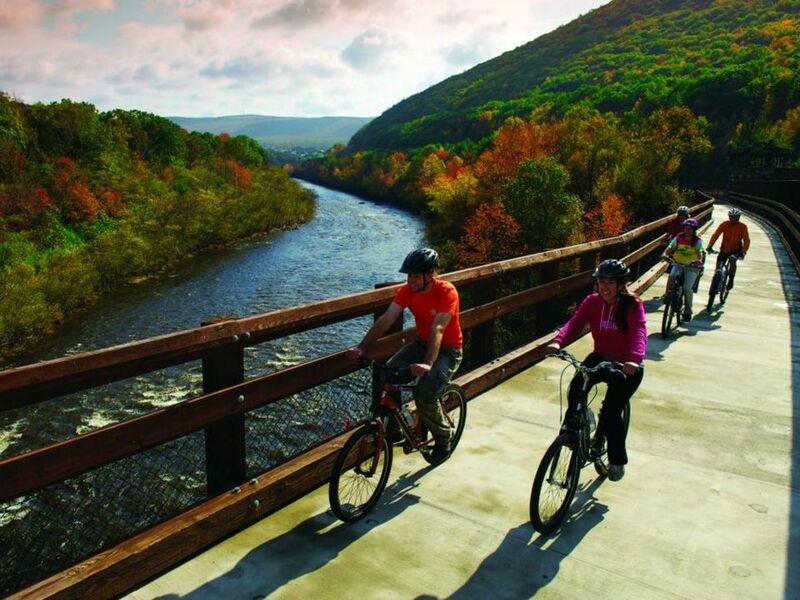 Accessible to both New York City and Philadelphia, the Pocono Mountains have long been considered a favorite outdoor playground, filled with mountains to hike, lakes for fishing and canoeing and woodlands for scenic beauty. The popularity of the Poconos began in the early 20th century when Philadelphia Quakers created a half a dozen recreational resorts that are still popular today. Over the years the area became known for popular all-inclusive resorts, including Skytop Lodge and Woodloch Pines (see below). The Poconos offer all the recreational pursuits that you would expect from a region full of mountains and lakes. Highlights include Bushkill Falls, a 300-acre park known for its eight waterfalls and more than two miles of trails. The highest waterfall, Main Falls, has a drop of about 100 feet. The park also offers mini golf, paddleboat rides, and fishing. The Poconos is home to several indoor waterpark resorts that are very family-friendly.